When choosing an anti aging cleanser staying away from harsh chemicals is extremely important. With oil production slowing with age, mature skin is more susceptible to being damaged by these synthetic ingredients. Unfortunately skin cleansers are one of the worst offenders when it comes these harsh chemicals. The following natural cleansers are made with natural ingredients that not only effectively cleanse your skin, but are also very gentle and provide your skin with nutrients, leaving it smooth and radiant, not dry and tight feeling. Enjoy clean, more youthful skin with one of these natural anti aging cleansers. Trilogy Cream Cleanser This is one of my favorites, as well as many other women. This is one of Trilogy's most popular products. Packed full of nutrition, over half of the bottle is a combination of Rosehip Oil, Evening Primrose Oil, Jojoba Oil, Almond Oil and Carrot Oil. Other ingredients are Orange Flower Oil, Geranium Oil, Frankincense Oil, Lavender Oil and Vitamin E. Everything aging skin needs and loves. All Trilogy products are made with 100% natural ingredients and contain no Parabins, Petrochemicals, PEG's, Pesticides, GMO's Harsh Surfactants, Synthetic Dyes and Fragrances. All products and packaging are biodegradable. 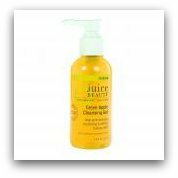 Juice Beauty Green Apple Cleansing Gel A cleanser that can transform dull lifeless skin into smooth radiant skin. It brightens, refines and balances out your skin and does so gently, leaving skin smooth and rejuvenated. Juice Beauty Green Apple Cleansing Gel contains organic apple and lemon juices that are rich in hydroxy acid and antioxidants making it an ideal choice for aging skin. Juice Beauty products are made with certified organic ingredients and packaging is 100% recycled. 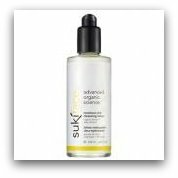 Suki Moisture Rich Cleansing Lotion This is a moisturizing cleanser that is not only good for mature skin, but good if you have combination skin as well. This could be the natural product for you. It contains gentle cleansing oils and butters such as Sunflower Oil, Grapeseed Oil, Beeswax and Cocoa Butter. Organic Lemon and Sage extracts lend a hand so your skin is refined, toned, balanced and in the end moisturized. All Suki products are packaged in glass containers and recycled cartons and only vegetable based inks are used. Products are 100% natural and over 90% organic. Trilogy Age Proof Active Enzyme Cleansing Cream This natural cleanser is a good choice if your skin is dull and needs a pick me up. It brightens instantly and renews tired looking skin. Papaya and Pineapple fruit contain enzymes that gently remove dead skin cells and other impurities giving your skin a rejuvenated, polished appearance. Licorice and Mulberry Extracts further brighten skin and even skin tone. Jojoba Oil, Sunflower Oil and Vitamin E nourish, sooth and moisturize skin. Add Rosehip Seed Oil, Avocado Oil, Chamomile Oil and Rosemary and everything your skin needs in a cleanser is right here. 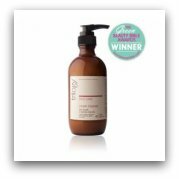 Contains 100% natural ingredients and no Parabens Petrochemicals, PEG's, Pesticides, GMO's, Harsh Surfactants, Synthetic Dyes and Fragrances. African Red Tea Foaming Cleanser This is another anti aging cleanser that removes eye make-up as well but is stiil gentle enough to use on even sensitive skin types. African Red Tea Foaming Cleanser doesn't strip your skin of all of it's oils, but still leaves your skin renewed and refreshed. Of course it smells yummy like many of their products do. Contains Carrot Seed Oil, Sweet Almond Oil, Shea Butter, and other natural ingredients that are excellent for mature skin. Ole Henriksen products are designed to achieve over all health and well being. Add one of these cleansers to you natural anti aging skin regimen!